My thoughts always fill my head before sleep. Last night was no different. As I lay trying not to vomit and just breath, as every muscle in my body ached from falling down the front steps in the snow storm and my new Tracey Anderson pregnancy project workout, my head was filled with 2012 and all that has happened. It was truly a year of despair, of love, of learning, listening, and feeling. Not only did we experience great joy we experienced great heartache. 2012 started out with the news of Elijah and Paige both being very ill. The end of January brought the death of Ron’s Sido (Grandma) after a long stay in hospice. February and March brought almost daily doctor appointments between myself and Paige. April came and so did Elijah, I remember being so relieved and happy the moment I saw and heard Eli screaming his little lungs out and thinking he was the most beautiful boy. his head of dark hair his cherub checks his full lips. How was it possible to have such and perfectly beautiful baby have a broken heart??? He didn’t look sick he looked perfect, it was true love. Through the next two weeks we were faced with fear, happiness, love, hope, the words no parent wants to ever hear “it’s time, he is suffering and we can do no more”. The end of April the greatest loss, and heartbreak. May brought more unknown feelings, questions, love, and support. My sales team was let go, and I didn’t even have the job I loved. Summer came and so did some relief of pain. I was able to spend quality time with the kids, My 35th birthday was in June and independence day around the corner. Our wonderful friends and family had surrounded us and provided us a safe place where we were free to mourn, free to laugh, free to come back to ourselves. July brought a new job in my industry, it also brought a new little miracle growing inside me. I could feel the tide changing starting in July of the good things that were to come. The light was coming up in out life’s. Paige had her first clean blood test and hadn’t loss any more weight. School started the kids were happy and smiling. Ron and I could once again take a breathe without feeling the ache in our chests. October brought more good news as Stella’s CVS came back normal, and then in early December with a good level II ultrasound and fetal echo-cardiogram. Paige had three perfect blood tests and gained 2 1/2 pounds!!!! Christmas came and we had all the kids for Christmas eve and Christmas morning. The family attended Christmas eve service at Riverview and Noel spoke about the light we all are and how we were given this gift when Jesus was born. What a perfect message for our family since it is what I refer to all the time in my writing and words to the kids and to you all. As we all turned on the little lights we were each given I could see how the light has been coming up since June. We laughed, we loved, we sang, we cherished each other and all we have. We were Thankful. I hope 2013 is the year for all of us and may the light shine on us all! Well I will get right to it Stella Rocks! We had our level II ultrasound today as well as the fetal echo cardiogram, both came back perfect. We have a little rock star on our hands. Stella measured in the 50th percentile and had a perfect heart! What a relief, I just laid on the table and cried with happiness, relief, peace, so many other emotions. Ron and I haven’t stopped smiling since we left! It was a restless night of sleep for both Ron and myself. I have been struggling with sleep through the entire pregnancy to be honest. Two nights ago I had a dream about Stella Grace, in the dream a whole group of our family and friends are singing over Stella who lays wrapped in front of us. We are singing the song “This is grace” by Matt Hammitt. In a earlier post named Grace which was wrote after Elijah’s passing I speak of this song. The part that gets me the most in the song is when Matt sings, “This is grace, this is grace, when we walk through the dark night. This is grace, this is grace, so we wait for the sun rise. I have faith the sun will rise.” I believe this was God letting me know the sun would rise on our family today and it did! I have spoke several times about how we chose our babies names again today I remember why we chose her name Stella Grace. Definition: The exercise of love, kindness, mercy, favor; disposition to benefit or serve another; favor bestowed or privilege conferred. Definition: The divine favor toward man; the mercy of God, as distinguished from His justice; also, any benefits His mercy imparts; divine love or pardon; a state of acceptance with God; enjoyment of the divine favor. Definition: Beauty, physical, intellectual, or moral; loveliness; commonly, easy elegance of manners; perfection of form. Last I want to thank everyone who prayed for us! Those of you who have supported us throughout this year, and wished us well or sent positive thoughts in our direction, IT WORKED SO FAR!!!! The pregnancy and our lives are moving along at a rapid pace it hard to believe I am a couple of days shy of 19 weeks along, about half way there! Over the last week I have been struggling with sickness still, even going into be treated for nausea and dehydration (this is while I am still taking my medicine to help combat the nausea). My belly is swelling and everyday I am getting bigger and bigger. Stella is kicking and I can feel her a few times everyday. I have a heart monitor that I used with Elijah so I can listen to her heart beat every morning and night typically around 150 beats a minute. I have faith she is growing stronger everyday! I write today because I have been having a hard time sleeping the last couple of nights due to my constant dreams. I am dreaming of Elijah a lot again. Reliving all we went through which would wake anyone up. I am looking down on the situation and watching it unfold, I wonder if this is because everyday we are getting closer to Stella Grace’s heart scan. 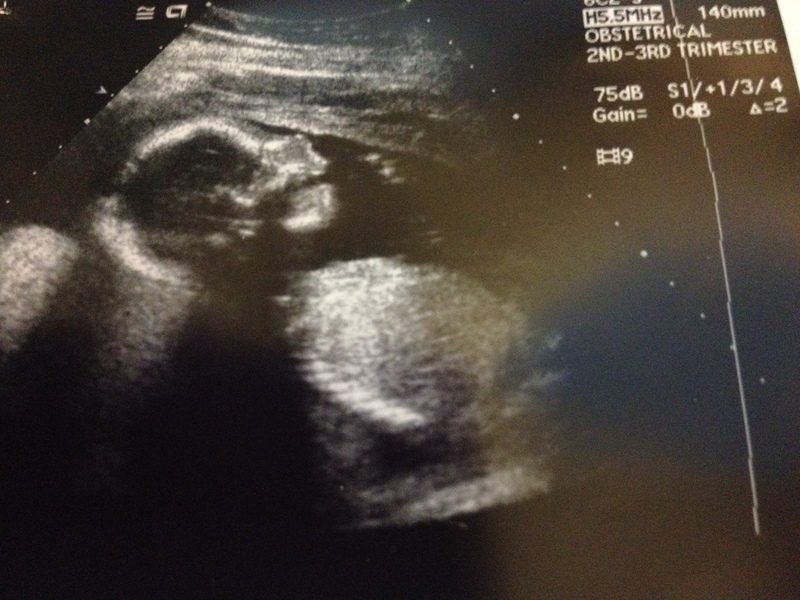 The scan is scheduled for next Wednesday the 12th of December. I have also been asked to write about our experience with ECMO. I realize this is something I would have to work on greatly to be able to share, it is not an experience Ron or I ever want to relive, so maybe this request has triggered my dreams. Though I try to push thoughts and the scared feelings away I must be holding on to them for my sleep. I really do believe Stella is healthy in my heart but it is my subconscious that is making me nervous. I can’t wait to come here next week and share our findings!